Is there any way of squaring the circle? What would happen if lawmakers voted against the withdrawal agreement? Just two weeks ago, it seemed as if Prime Minister Theresa May had finally managed to craft a Brexit proposal that could unite her Cabinet. But after her Chequer's away day, a string of ministers resigned in protest at the agreed plan. May was also forced to make several concessions to win the support for a piece of customs legislation from a sizable Brexiteer-faction of the Conservative Party known as the European Research Group (ERG), potentially complicating the implementation of her Brexit plan. Then, the next day, she came very close to losing a vote on future membership of a customs union, after a handful of pro-EU Conservative MPs rebelled against the government. What’s becoming increasingly clear is that whatever direction the Prime Minister ultimately decides, she cannot count on a majority of MPs backing it. With no obvious way out of the current impasse, many are now asking: is it inevitable that the UK crashes out of the EU without a deal? 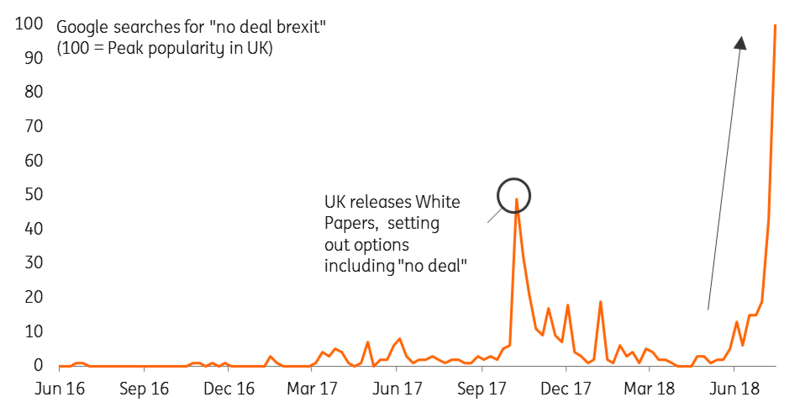 Certainly, talk of “no deal” has surged, partly as the UK government has become more vocal about contingency planning over recent days. But it’s worth remembering there are actually two deals in play here. There’s the deal on the future trading relationship, and there’s the withdrawal agreement. Avoiding the chaos of crashing out of the EU in March next year relies on resolving the latter. While the EU is highly resistant to the UK's latest Brexit proposal, it looks like Brussels increasingly accepts that realistically no progress can be made on the future trading relationship before March 2019. If nothing else, it will be reluctant to show its hand and engage in trade negotiations while the UK’s position is so volatile. We suspect the EU will now double down and focus on getting the withdrawal agreement over the line before the UK formally leaves next year. Of course most of this withdrawal agreement – the UK’s financial liabilities, citizens’ rights and transition period - have already been decided. The major sticking point remains the so-called Irish backstop – the fall-back option for Northern Ireland should the overall EU-UK trade deal fail to result in a frictionless trade across the border, and both sides remain staunchly opposed. Under the EU’s backstop proposal, Northern Ireland would, on its own, stay within the single market for goods and a customs union. But the UK government - concerned this would result in regulatory barriers within the UK, as well as damage the fragile political situation in Northern Ireland has said it cannot accept this. Instead, the British government would prefer a backstop where the UK as a whole remains in a customs union until the systems underpinning its proposed “facilitated customs arrangement” become workable. For a range of practical and political reasons, Brussels is heavily resistant to this idea. Possibly. The EU has offered an olive branch by saying that, if regulatory barriers arose between Northern Ireland and the rest of the UK, efforts could be made to “de-dramatise” any checks at the border. This could involve having red and green customs lanes at the border to keep traffic flowing (as proposed by the Northern Irish Civil Service), or trusted trade schemes. Some have also suggested that any checks – particularly for agriculture where inspections tend to be more stringent – could be done at the production location instead of at the border. If a compromise is to be reached, something along these lines looks most likely at this stage. Realistically though, getting parliamentary approval could be very tricky. While most MPs may eventually conclude this would be the ‘least worst’ compromise in practical terms, many may view it as an unacceptable risk to the Northern Irish peace process. There are legal hurdles too; following the ERG’s successful amendment a week or so ago – which by law prevents a hard border being created in the Irish sea – getting this type of backstop passed may require Parliament to change legislation. Scenario one is "no deal", where the UK exits the EU and begins trading on WTO terms. As we've discussed, this would likely see significant congestion at ports, while the sudden imposition of regulatory and customs checks would likely see supply chains severely distorted. For this reason, reports suggest the government is considering stockpiling food and medicine, as well as battery power supplies, to offset possible shortages. And while the UK has suggested it would simply keep borders open to minimise this immediate disruption, it’s much less likely that the EU would do the same. For those reasons, we suspect the UK government would be very reluctant to accept “no deal” in the end – and for Brexiteers, they would be wary of taking the blame for the economic consequences. This could happen if the government accepted there was no majority in Parliament for what has been agreed and decides to put the deal to the people. While there has been a lot more discussion about this in recent months - bookmakers now put the odds of a second vote at just 3/1 - we suspect it's still fairly unlikely. This is partly because no major party is calling for another referendum, but also because there isn't enough time to set one up before March next year. Referendums require legislation to be passed in parliament, and in the case of the Brexit vote in 2016, this lawmaking process took around a year – and that’s before taking into account the time required for campaigning. If the government was really set on having the people decide, then a general election would be more likely. This would require two-thirds of MPs to agree, but even then, time would be short, and there’s no guarantee another election would result in any decisive conclusions. And with Conservatives trailing Labour in the polls by one point, the government is unlikely to decide to trigger an election lightly. If there's no time, or willingness, for a general election, then the government may be forced to ask for an extension to two-year article 50 period. Assuming this was to come very late on in the process, the EU may feel there's little to be gained by saying no - although it would still require agreement from all 27 member states. But while an extension would prevent an imminent cliff edge, it's not clear what more it would achieve. According to The Guardian, EU officials don't believe the lack of time is the real issue in the way of getting a deal. Instead, it would want to see signs of a political solution, such as a second referendum before considering extending article 50. The bottom line is that all of these scenarios – be it ‘no deal’, second referendum, another general election or an extended article 50 period – are all highly undesirable for Brexiteers. Each one makes it more likely that Brexit will be reversed at the last minute. So in the end, a compromise on the Irish backstop that enables the UK to leave the EU formally and start the transition period, might not sound so unpalatable after all. At this stage, we think this, or a similar kind of fudge, is the most likely scenario. In case you missed it: From ‘foe’ to friend?